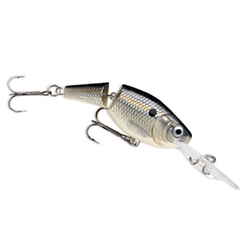 The Jointed Shad Rap has a Natural Baitfish Profile and made of Premium Balsa Wood. This Crankbait has a Shallow Running Deep Diving Lip Design and the Classic Rapala "Wounded-Minnow" Slow Retrieve. Quantity Size 4-6ft 1-1/2" 6-13ft 2"
Quantity Size 4-6ft 1-1/2" 6-13ft 2" 7-15ft 2-3/4"
Quantity Size 6-113ft 2" 7-15ft 2-3/4"
Quantity Size 4-6ft 1-1/2" 7-15ft 2-3/4"